And yes it is the final tag and can't believe how quickly time is flying. I am so happy that a few of you have continued with me on my creative journey and I hope you have enjoyed it as much as I have. On this last tag I would like to remind you that the first place prize is ALL 12 tags and....2nd prize is a goody package of stuff to make your own tags. So.....final item.....when you post for my last tag, tell me what you have enjoyed the most of this presentation on my take and why you want these 12 tags. A few of you have followed me all the way through and I am so grateful for your lovely comments. So here is the final tag and I hope you have a HOHOHO Merry Christmas. 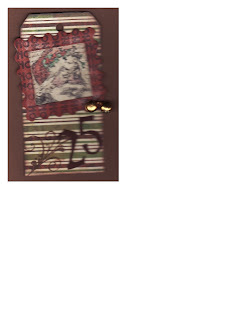 This tag I used Basic Grey 2 sided scrapbook paper, I used a Tim Holtz Santa Stamp and stamped it on ivory coloured CS. I then trimmed the stamp to fit behind this chipboard frame from my stash. I dabbed Fired Brick DI on the frame and really liked the hit and miss it created on the frame instead of the frame being coloured in solid. 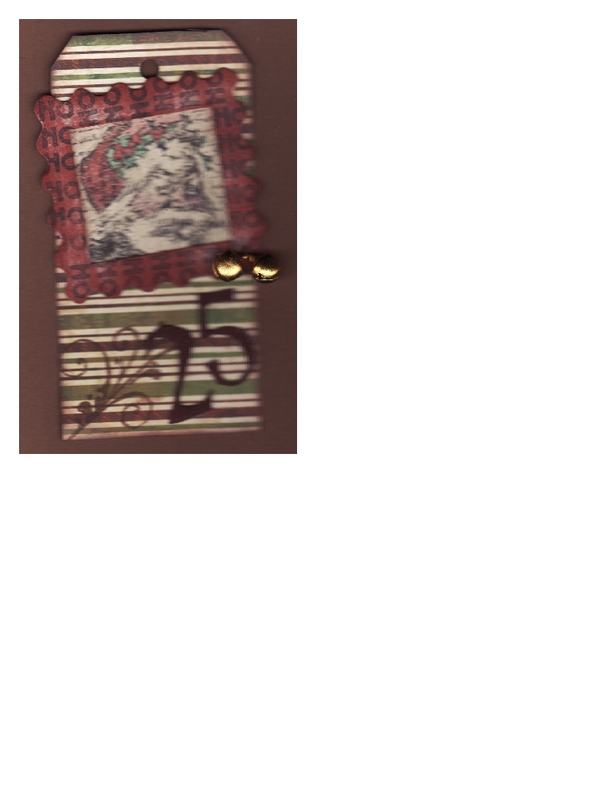 I used Jumbo Java ink to ink around and into the stamped image and coloured the holly and berries and Santa's face with some pencil crayons before I place the frame on. I also put a tiny hole in the bottom right of the frame to feed my thin wire through that I had the jingle bells attached to. I also stamped in black very lightly all around the frame with HoHoHo. I then used 2 sided tape and place the Santa image onto the back and just pressed the bit of wire from the bells onto the tape to hold it in place. Then I placed it on the tag that was previously inked with Jumbo Java and a tiny bit of Fired Brick DI. I then cut out of fun foam my numbers and painted them with Candy Bar Brown acrylic paint. I stamped a flourish in Jumbo Java and then applied distress embossing powder, embossed then rubbed the release crystals off. And that was it. I just have to find a ribbon or paint some gauze for a hanger. Again all tags will have a hanger or ribbon on them, this is my last one that requires one. So remember to comment and tomorrow I will be picking 2 lucky winners. Thanks for dropping by and remember to keep the Christ in Christmas. Leslie all of these tags are beautiful. I love them all. My favourite is the one with the crows that has a three dimensional look. Well done sweetheart. Someone is going to be very, very happy to get these. I have picked my winner let's see if we both choose the same person! Love ya! Fabulous! Sorry, I didn't get to the last one right away - started a new job (nursing/12 hour days - yikes!). So happy to have been a part of your creative journey! Thank you, again! ....and you did a fab job on the little bags using Jen's tute!